Deliciously Creamy No-Bake Chocolate Cheesecake Bites, are perfect for any gathering – from holiday entertaining to party snacking. With a little bourbon, these boozy bite-sized treats will be a devoured in minutes! Mix the chocolate, bourbon, and salt together to form a smooth mix. Add the cream cheese and confectioner’s sugar and whisk/mix until everything is mixed through and fluffy. Cover the cream cheese mixture and refrigerate for a few hours until the mix is chilled. Using a small cookie scoop, scoop out a portion of the cream cheese and place it on a piece of plastic wrap. Wrap the plastic wrap around the cream cheese to form a mini ball. Place the mini balls in the crushed Oreos and coat each ball well. Place the coated mini cheesecake bites on a plate, cover with plastic wrap and chill until needed. Stick toothpicks in the balls before serving for easy presentation. Place the cream cheese chocolate mix in a large piping bag. Cut a 1/2 inch hole in the piping bag and smoothly pipe out 1 1/2 inch large mounds of the cheesecake mix on the lined cookie tray. Cover and refrigerate the tray for a few hours until the cheesecake balls are firm. 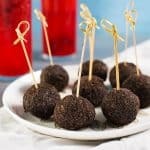 Place the firm cheesecake balls in the crushed Oreos. Roll them in the crushed Oreos to coat generously and to form a smooth ball. Cover the cream cheese mixture and refrigerate for a few hours until the mix has chilled well. Form a large double layer of plastic wrap on your work surface. When the cream cheese mixture has been chilled, scrape the whole mix onto the plastic wrap. Gather the edges of the plastic wrap around the mix and twist to form a large smooth ball. If the cheese softens too much, wrap and refrigerate so that it firms up again. Unwrap the cheese ball and coat it all over with crushed Oreos. Place the coated cheese ball on a serving plate, cover and chill until needed. Serve with cookies. *If you like this recipe, leave me a comment and rate it with some stars! Thank you!